Food inspires people in various ways. Sometimes it is a childhood memory, a single bite that takes you back to a specific moment, or recalling the spark that kindles a romance. 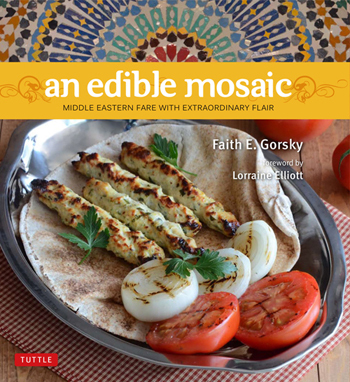 Enter Faith Gorsky, whose journey to love led her to start a food blog and then write a book, An Edible Mosaic. Her book shares a love story about her husband and how romance led her to discover her love of food and the magic of Middle Eastern cuisine. Food inspires people in various ways. Sometimes it is a childhood memory, a single bite that takes you back to a speciﬁc moment, or recalling the spark that kindles a romance. Enter Faith Gorsky, whose journey to love led her to start a food blog and then write a book, An Edible Mosaic. Her book shares a love story about her husband and how romance led her to discover her love of food and the magic of Middle Eastern cuisine. A good friend of Oldways introduced us to Faith. 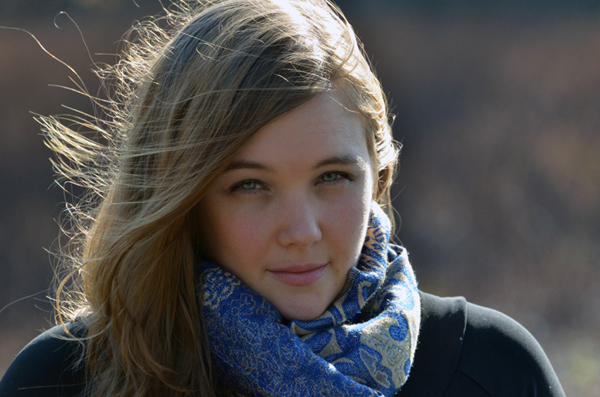 When we learned about her story we couldn’t wait to speak with her for one of our Q & A’s. OLDWAYS: For those not familiar with An Edible Mosaic can you tell us why you started the blog and how it evolved into a book? FAITH: I started my blog the day after Mother’s Day in 2009 to share the Mother’s Day meal that my family and I made for my mom. I wanted to show that someone like me – who is by no means a professional chef – can make a decent meal to share with loved ones. After that it was my passion for cooking along with the inspiration I got from readers and other food bloggers that kept my blog going. in a kitchen cooking. People always tell a writer to write about what they know, and I think it’s the same thing with a cook. If you’re doing something that’s so natural that it’s an extension of yourself, I think it’s important to share your passion, whether it’s through a food blog, cookbook, or by any other means. In this way, food blogging truly solidiﬁed my dream of wanting to publish my own cookbook. When I got my cookbook deal, I knew it was right because every aspect seemed to fall in place. I had just received my ﬁrst DSLR camera as a gift from my hubby and I was working on improving my photography. Around the same time, I started talking to an editor at Tuttle Publishing and I mentioned that my husband and I were about to take a 40 day trip to the Middle East to visit my husband’s family there. The editor told me they might be interested in publishing a Middle Eastern cookbook, and to take notes and learn as much as I could. Before that I had been to the Middle East four diﬀerent times, each time absorbing more of the culture and delving deeper into learning the cuisine, so for me, an assignment to learn as much as I could in my mother-in-law’s Syrian kitchen was nothing more than a labor of love. OLDWAYS: You had such a special opportunity to spend time with and learn from your mother-in-law. What are the most profound cooking lessons you took away from your time together? FAITH: The most profound lesson I learned from my mother-in-law when it comes to cooking is that food is more than just sustenance for the body; it’s also a way to demonstrate your love for your family, a way of keeping old methods and knowledge alive, and the biggest honor you can show a guest coming into your home. And it is often used medicinally too. As Ann Wigmore noted, “The food you eat can either be the safest and most powerful form of medicine or the slowest form of poison.” In the Middle East, common food remedies are used just as often, if not more so, than western medicine. For example, a diabetic might have two large green onions instead of an insulin shot. Or someone with an upset stomach might drink a cup of warm ginger-infused water…or someone having trouble sleeping might have a bowl of plain, unsweetened yogurt before bed. I’ve noticed that in Middle Eastern culture and cuisine, food plays a deeper, more intense role in peoples’ daily lives. OLDWAYS: For those who are just learning about Middle Eastern cooking, what are the top 10 ingredients you would recommend to ensure they have a properly stocked pantry? Olive Oil: For just about every recipe that calls for oil (except deep-fried dishes, as vegetable oil is preferred for deep-frying). Rice: For making beautiful pilafs like Maqluba (Upside-Down Rice Casserole), Kebseh (Red Rice Pilaf), and Sayadieh bil Samek (Fish Pilaf with Caramelized Onion). Bulgur Wheat: For making favorites like Kebseh and Tabbouleh. Dried Lentils: Green or brown lentils for making soup like Adas bil Hamud (Lentil Stew with Swiss Chard and Lemon Juice) and pilafs like Mujaddara (Lentil and Bulgur Wheat Pilaf with Caramelized Onion); red lentils for making soup like Shorabet Adas. Dried Beans: Chickpeas for making hummus, falafel, and Tissiyeh (Creamy Chickpea and Yogurt Casserole); fava beans for making Foul Mudammas (Mashed Fava Beans with Olive Oil, Lemon Juice, and Garlic). Tahini: For making dips like hummus and Mutabbal Batinjan (Eggplant dip) and dressing for things like salad, fried vegetables, and ﬁsh. Pomegranate Molasses: For dips like Muhammara (Red Bell Pepper-Walnut Dip), for stews like Kowaj (Meat and Vegetable Casserole with Pomegranate) and M’nezalit Zahara (Cauliﬂower Meat Sauce), and as the secret ingredient in falafel sandwiches. Rose Water and/or Orange Blossom Water: For giving a lovely, fragrant ﬂavor to many Middle Eastern desserts, including Muhallibeh (Rose and Orange Blossom-Scented Milk Pudding) and Aima’a (Rose and Pistachio Ice Cream). Arabic 7 Spice Mix: For seasoning many chicken, beef, and lamb dishes. Cardamom: For making various spice mixes, and for adding to ground coﬀee to make wonderfully aromatic Turkish coﬀee. OLDWAYS: We know you must have mastered some great cooking techniques. Can you share one or two of your favorites that you think every cook should have in his or her back pocket? Rinse the rice under running water to remove any talc or excess starch (this yields ﬂuﬃer rice). Soak the rice for 10 minutes in tepid water, changing the water once (this makes the rice less brittle, helps it to expand to its full length, and shortens the cooking time). Toast the rice in a bit of clariﬁed butter or vegetable oil in a thick-bottomed saucepan over medium heat. Add hot water – but you don’t need anywhere near the 2:1 ratio of water to rice that you might be used to! The ratio of water to rice needed for this method is somewhere between 1 ½:1 to 1:1. Bring the rice up to a boil, then cover the pot, turn the heat down to very low, and cook until the rice is tender but not mushy, and water is absorbed (about 10 to 15 minutes, depending on the heat and humidity that day). If it looks like your rice needs a bit more moisture, you can add a splash more water while cooking; otherwise, don’t open the lid. Turn oﬀ the heat and let the rice sit for 15 minutes before ﬂuﬃng and serving. OLDWAYS: Well now that you have gotten our appetites and interest piqued we have to ask, would you mind sharing a recipe with our readers? FAITH: Absolutely! A salad would be perfect since it’s found as an accompaniment to every big Middle Eastern meal. 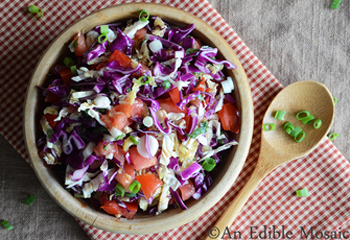 Cabbage makes this salad hearty and a bit sturdier than your average salad. Prepare Lemony Mint Salad Dressing. Whisk together the garlic/salt mixture and lemon juice; gradually whisk in the olive oil in a thin drizzle. Stir in the mint.